Your wines, cigars, wooden and metal items, medicinal herbs, or other type of product you are storing, can be easily damaged by large and rapid changes in humidity and temperature. Your RV or vacation home can suffer from high humidity when you are away. Now you can protect your investment by simply placing the Blustream® Sensor in the storage container. The patented Bluetooth sensor provides temperature and humidity data to the free smart phone app to alert you of conditions before damage occurs. 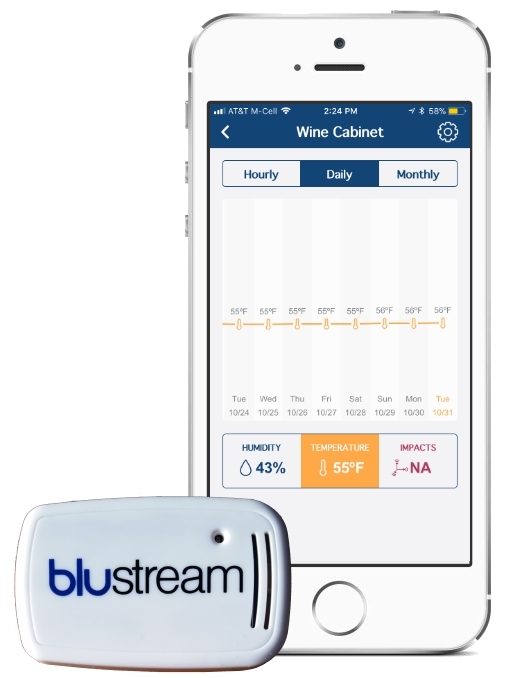 When the Blustream® App detects dangerous conditions, notifications are available on your device allowing you to take corrective action before damage occurs. Cataloging and monitoring all your valuables is so easy and convenient, you’ll want one for everything you own! Readings every 30 minutes extends battery life. A second compatible smart device is required for all remote monitoring scenarios. The best part, you probably already have one lying around. Use an old or spare iPhone, iPad, Android phone, tablet or more! If you don’t have a spare device, see our recommendation through Amazon below. An active internet connection is required on both the bridge device and your local device. Download the Smartphone App from either the Apple App store or the Android Play store. Startup is simple using our Quick Start Guide. A second compatible smart device is required for all remote monitoring scenarios. The best part, you probably already have one lying around. Use an old or spare iPhone, iPad, Android phone, tablet or more! If you don’t have a spare device, we recommend this device through Amazon. An active internet connection is required on both the bridge device and your local device. Remember the Blustream sensor is a tool to help you but you are ultimately responsible for the safe keeping of your valuables! As stated in the Terms of Service Blustream Corporation is not responsible for any loss, damage, or issues arising to your valuables.